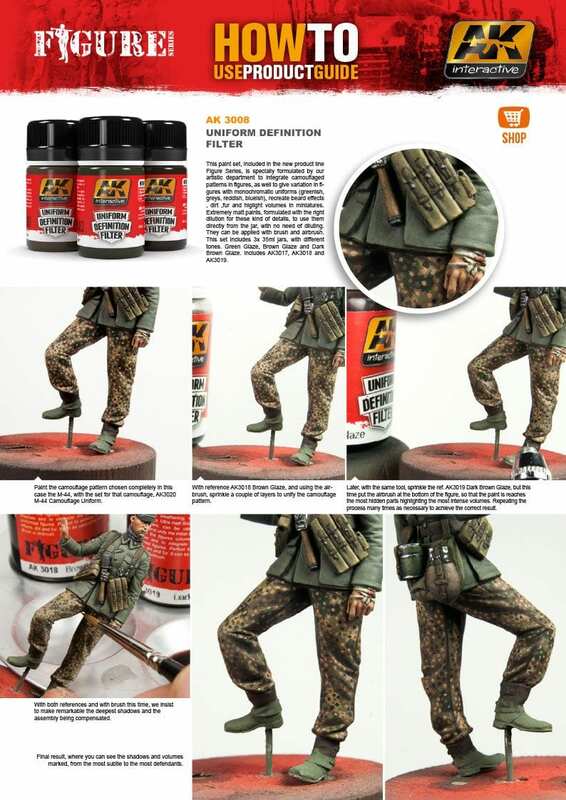 Buy the newest weathering paint sets with the best sales and promotions. Find cheap offers for weathering paint sets in our online store. _ AK-022 Africa Dust Effects. This weathering set contains three different colors to make streaking effects on your scale models. These streaking effects colors are very versatile in the sense that these colors can be diluted down to the level of washes. This multiuse weathering set is a must have for anyone who strives for realistically weathered models. _ AK-014 Winter Streaking Grime. _ AK-026 Slimy Grime Dark. _ AK-027 Slimy Grime Light. Three products from our weathering range for those who love modeling green vehicles. Great for doing streaking effects, and dark or rust colored washes. _ AK024 Dark Streaking Grime. _ AK045 Dark Brown Wash for Green Vehicles. _ AK046 Light Rust Wash.
_ AK-065 Filter for Afrika Korps Vehicles. _ AK-066 Afrika Korps Wash.
_ AK-067 Streaking Grime for Dak Vehicles. This weathering set was developed with modern armor enthusiasts. We have designed this special set that contains all the necessary products you need to weather any vehicle painted with the three classic NATO colors, Brown, Green and Black. This set contains three products designed for and tested on NATO vehicles. This set allows the modeler to add washes, filters, and rain marks. _ AK-074 Rainmarks for NATO Tanks. _ AK-075 Wash for NATO camo vehicles. _ AK-076 Filter for NATO Tanks. This set is complete with different products to employ mud effects on your models. We have designed a special color based on Russian landscapes most notably for the battle of Kursk. We have also created a color for wet earth. To give depth and volume to the mud, we have included a plaster kit so you don’t have to spend your time looking for one enabling you to start painting your model right out of the gate. We have also included the definitive product for doing effects of dampness, rain or standing water on the surface of your model. This product is very different from all the other products on the market and you will see that with your final results. This set is complete with a pigment based on dark earth, which you can mix with both the plaster and the wet effects product to produce some great additional effects. _ AK-079 Wet Effects Fluid. _ AK-080 Summer Kursk Earth. This set contains everything necessary to do great realistic effects on any type of engine or metal objects, such as tank tracks. There are two colors for the engine, for effects of dirt and grease, which can give an unbelievably real finish. For the metal objects and tracks we have designed a wash, a dark rust colored pigment and a super metal colored pigment, which has no equal on the market from any other brand or manufacturer of pigment. This steel colored pigment is very bright when you rub it, the more you rub it the shinier it gets. Also this ultra-fine pigment doesn’t contain metallic particles as you would normally find in other products on the market. Achieve a realistic steel finish like you have never seen before. _ AK-085 Track Rust Pigment. _ AK-086 Dark Steel Pigment. The interior paint of AFV´s used to be a problem for even the most experienced of modelers. This set makes this task easy with three different products. First of all we have an acrylic paint which represents the interior color of German vehicles during WWII. This color also can be used for the interiors of many other AFV´s. Also, we have included two weathering products, one for interior washes and another for streaking effects over the surface of interiors. _ AK-093 Wash for Interiors. _ AK-094 Streaking Effects for Interior. The modern American vehicles in Afghanistan and Iraq are becoming a theme that is just as important as the German vehicles from WWII. Many brands of plastic kits are now inclined to produce vehicles from these two theatres of operations, OIF and OEF. This set has been exclusively designed for modelers that make these types of vehicles, they can however be used for subjects of other armies & time periods. These American vehicles tend to have a particular aspect and to achieve these affects the set contains one product for washes and another for the streaking effects. Also included is an acrylic base color of one of the most common colors of the American forces in desert zones, the FS 33446. A color faithfully reproduced and lightly softened to compensate for the scale effects. You can use this color on all your American vehicles and it can be weathered with the 2 weathering effect products included in this set to obtain results very close to that of real vehicles. _ AK-121 OIF & OEF Wash.
_ AK-122 OIF & OEF US Vehicles Base color. _ AK-123 OIF & OEF Streaking Effects. With the help of this weathering set, the modeler can achieve realistic weathering effects on aircraft engines. The products contained in this set have been specially formulated by our art department to help the modeler achieve maximum realism on their models. These high quality products can be dissolved with our white spirit should the need arise. _ AK2019 Aircraft Engine Oil. _ AK2033 Aircraft Engine Wash.
_ AK2039 Kerosene Leaks and Stains. This specific set focuses on the weathering of aircraft landing gear. This set has been specially formulated by our art department to achieve maximum realism on your models. These products can be dissolved with our white spirit if needed. _ AK2029 Landing Wash Gear. _ AK2031 Landing Dust Effect Gear. _ AK2032 Shafts Grease & Bearings. With this products the modeler can achieve many different finishings for the exhausts of all airplanes in all eras. This is a prone area for rust and dirt accumulation and the pigments are perfect to achieve this textures. _ AK4061 Sand Yellow Deposit. _ AK4062 Light Dust Deposit. _ AK4063 Brown Earth Deposit.